Pannell Discussions » 289 – Interpreting evidence through an ideological lens » Ideas in economics, environment, policy and more. Humans are prone to “confirmation bias”, meaning that when we see evidence, we tend to interpret it in a way that reinforces our existing beliefs. I felt I was observing confirmation bias in action when I observed a recent article that discussed some research we conducted. The tendency for confirmation bias is so strong that, in some cases, people who hold opposing views can both find support for their conflicting positions from exactly the same evidence, resulting in attitude polarisation. I would guess that this phenomenon has probably contributed to the polarization of attitudes to climate change, for example. Occasionally I see an example of my own research being interpreted in a way that seems to exhibit confirmation bias. A recent example is our research showing that farmers in central Victoria, on average, pay more for land that includes some native woody vegetation, compared with land that is fully cleared (Polyakov et al. 2015 and see PD#287). There was some nice press coverage of the research (here and here), some social media attention, and also a brief article published on “Freedom Watch”, a web site published by the Institute of Public Affairs (IPA). The IPA describes itself as “the voice of freedom” and on the Freedom Watch site the published articles cover issues such as freedom of speech and legal restrictions on various freedoms, including laws that restrict racial discrimination, live betting ads, and political donations. Of course, different people have different opinions on the sorts of restrictions to freedom that are discussed by the IPA, but the authors of articles on the site would tend to be at one end of the spectrum of public opinion about these issues. Now I’m an economist, so I’m certainly favourably predisposed towards free markets, and I’m not unsympathetic to the argument that we should avoid having laws that needlessly restrict freedoms, but this article really feels like the evidence has been shoehorned to support a pre-determined position. For a start, the premises of the article are questionable. I’ve worked on issues of agriculture and the environment for many years, in the process dealing with people from many different environmental organisations, and I’ve never heard anybody say that farmers hate trees. 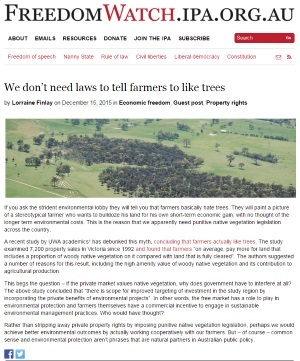 Maybe some environmentalists do think that, but the great majority of people who are concerned with environmental issues in rural areas have a much more realistic and nuanced understanding of farmers’ attitudes towards trees. The claim that farmers’ hatred of trees is put forward as the reason for legal restrictions on land clearing is specious. Those arguing for these legal restrictions don’t need to invoke a non-existent hatred of trees. The real argument is that there are public benefits from preservation of native vegetation that are not sufficiently factored into the farmers’ private decisions about land clearing. The public benefits include conservation of threatened species or ecological communities, reduced salinity in waterways, and aesthetic benefits. Why does government have to interfere at all? Because, with so little native vegetation left in many regions, the marginal value of protecting it is likely to be very high, so that the public benefits of the legislation are likely to far outweigh the private costs. Even though farmers like some trees, when the benefits to the rest of the community are factored in, the optimal area of trees is larger than farmers would select for themselves. Economists describe this situation as “market failure”, since the aggregated decisions of private individuals do not add up to the best outcome for society as a whole. Lorraine Finlay’s argument that we should work cooperatively with farmers makes me wonder whether she’s aware of existing programs that do just that. Ever since the start of the National Landcare Program in around 1990, there have continuously been major national programs built on working closely with farmers to improve environmental outcomes. That long experience has shown us that the voluntary/cooperative approach can work effectively up to a point, but is less successful for the more challenging environmental issues that are more expensive to deal with, like salinity and biodiversity conservation. It doesn’t necessarily follow that legislation is the best response, or that the system we have in place is as fair and efficient as it should be, but I do think it’s clear that a voluntary/cooperative approach is not sufficient if we seek to maximise the overall public and private net benefits. We can also observe the results of a recent policy experiment in Queensland, in which a state government led by Premier Campbell Newman made it easier for farmers to clear native vegetation if they wished to. The result was a surge in clearing which is so large that it is likely to wipe out all of the gains in carbon abatement from the Australian Government’s Direct Action program. Apparently, the positive attitude towards native vegetation that we identified amongst farmers in central Victoria does not apply uniformly across the country. To be fair to the IPA, they aren’t the only ones to make less-than-completely-balanced use of our results. A Tweet from @ARC_CEED (which funded our research) said “Study @MaksymPolyakov @dpannell66 finds trees increase value of rural properties up to 25%”. That’s perfectly true, although the 25% result was an extreme case, and only relevant to very small properties. Another of our conclusions that hasn’t been picked up in any of the commentary is that increasing the area of woody native vegetation on a property can actually decrease the property value if the area is too large (see the graph in PD#287). It’s interesting that both sides are more enthusiastic about the conclusion that trees can increase property values. Posted on 7 March, 2016 by David Pannell. This entry was posted in Agriculture, Environment, Natural resource management, Policy. Hi David, Great article on a very important topic if we are to restore biodiversity. Not sure that this will be of interest but through my bias (perennial grassland focus) most areas that are now cropped in Victoria were grassy woodland ie more grassy than woodland. Putting any type of perennial vegetation back into a stripped out annual system will create improvements. Rainfall and seasonal distribution of many areas means that they need to go back to grassy woodlands not woody grasslands. For me the VVP needs to be perennial grass based, high landscape function grassy woodland and areas like the Otways need to be forest. thanks David for this interesting piece – I guess we are all prone to confirmation bias and one way of dealing with it is to do as you have done and that is to call it when it occurs. Thanks Prof Pannell, thanks for the wonderfull article. Looking forward to articles. Economists have never known anything about epistemology. Even, in spite of dealing with the most precise language: math. Knowing the basics of epistemology would lead you to a different conclusion about “bias”. It is very likely that the “miscommunication” that generated the “bias” originated in your use of the language. Very interesting. I’ve been working on this problem from a practical point of view – as in how much can we do on our two farms that will improve biodiversity and resilience and simultaneously maintain a farming income? It’s a tricky balance. I also find that while most farmers are not against conservation, most don’t have time or resources to make it a priority.